There are a number of big decisions to make when you’re publishing a book, and the decision between making it available as a printed book, an eBook, or both, is one of the biggest. So, firstly let’s address the elephant in the room: are eBooks taking over? It was very widely expected that they would. It is happening in all walks of life. Traditional solutions are being replaced by new technologies. CDs disappeared, DVDs quickly followed, and nobody wears a watch anymore... unless it can phone your sister, text your parents, and turn on the lights in your ‘smart home’ of course. But it isn’t happening with books. It looked that way for a while; eBooks were the new kids on the block, sales were soaring and traditional books showed signs of faltering. But things have since levelled out. In fact, sales of eBooks have started to fall and printed books seem to be over their little wobble. What is happening with eBooks is more comparative with the impact tablets and mobile devices are having, than with the impact Netflix had on DVD sales. People aren’t using desktops any less now that mobile devices are available, tablets are eating into our free time, not our desktop time. eBooks aren’t replacing printed books, they are an extra. Okay, so the graph is a little outdated now, but you can see the pattern. The emergence of mobile devices hasn’t taken away our desktop time. We’ve just started spending more time looking at screens. 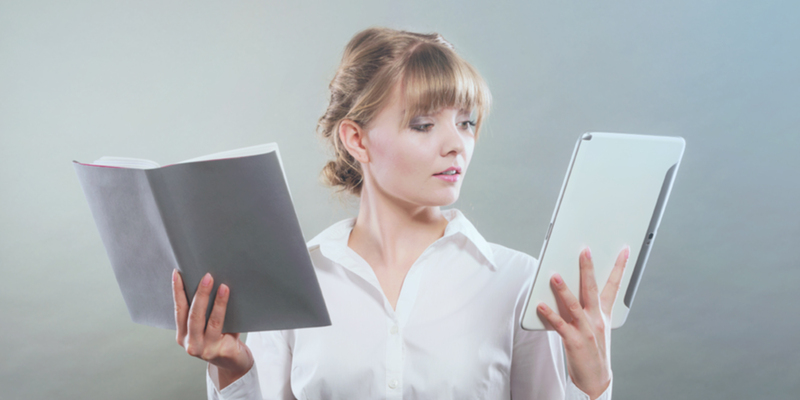 So, should you publish your book as a printed book or an ebook? Back to the debate: print or eBooks. Before delving any further, you need to know the answer to this question: what do you want from publishing your book? Do you mainly just want your message/story to be read? Do you want your story to be the next best seller? Do you want to be picked up by traditional publishers? Do you want your message to be remembered? Do you want to sell your books at conferences/events? Once you know your purpose for your book, it can help influence your decision of how you wish for it to be presented to the world. After all, it’s not just about you and what you want ‐ it’s a buyer’s market, so you need to always keep in mind, what do your readers want from you? Do they want an eBook or are they happy with the print files? It’s a tough one to answer. It is also very difficult to answer the question ‘who reads eBooks?’. This is largely because the world’s leading provider of eBooks, Amazon, is very secretive. Studies suggest that there isn’t a specific demographic that has been swayed towards eBooks. There isn’t a gender bias or even an age bias. In fact, defying the expected, Millennials are among the least likely to read eBooks. If you’ve already published a few books and are trying to decide whether or not to go down the eBook route for your next title, the best thing you can do is to ask your readers. Get a feel to see if it’s worth venturing out. Run focus groups, or put the question out there on social media. It’s important to do your research. You should also check the best seller’s charts. What books are selling well on eReaders? If your book falls into a similar category then maybe the audience is out there for you. What Does Well on eBooks? A study by The Guardian newspaper found that most eBook readers are avid book readers. But whilst their book shelves are crammed full of classic, decorated authors and mainstream titles, their eBook readers hide their alternative side. The eBook is reserved for the books they don’t want everyone to know they are reading. The theory is that the books you read say something about you as a person, and if you don’t like what a book might say about you, you buy it as an eBook. That way no one will ever know. We all look at the cover of the book that person opposite us on the train is reading, don’t we? With this in mind, it might come as little surprise that erotica stories perform very well on eBooks. As do paranormal thrillers, fantasy books, and tales of vampires and elves. Read by adults who think they would be perceived as childish if they were caught reading the printed versions. In general, people are more likely to take risks with eBooks; stories that cover risky topics or don’t quite adhere to traditional genre boundaries often do well. Novellas are also high performers as eBooks. Stories that are between 15,000 and 40,000 words long; longer than a short story, but not quite qualifying as a novel; stories that traditional publishers wouldn’t usually touch. They can be snapped up cheaply and read quickly on an eBook, and so perform well. Quite a lot really. Physical book sales considerably outnumber eBook sales in pretty much every genre. Still, some books are slightly less likely to be read as an eBook. Books that people are relatively certain they will like are more likely to be purchased as a printed book. Non-fiction religious books, self-help guides, autobiographies, art books, and children’s books don’t do as well on eBooks. Your genre could play a big factor in your decision of how you want your book to be presented ‐ just think, would it be something you would want in your hands, to visually explore, or is it just a brilliant story? See, I told you they were compelling. If you’re well and truly compelled to publish your book as a printed book, take a little look at our printed publishing package. Publish an eBook ‐ Get with the Times! Some indie authors find that when they’re first making a name for themselves it’s easier to sell eBooks than it is printed books ‐ as people are more likely to take a risk on a new author if it’s a cheaper eBook than a pricier printed book. You don’t have to worry about distribution. Your books are just downloaded. You don’t need to arrange for anyone to put them in the post. Pssst. Convinced by these points? Our eBook publishing package might just be perfect for you. Why Even Choose Between eBook and Printed? "Wait, you’re telling me I can have both?" I have a bit of a personal gripe with this one. We seem obsessed with binary decisions: Apple or Microsoft? Cats or Dogs? Print or eBooks? Why can’t we like all of them? There are benefits to publishing a printed book, and there are benefits to publishing an eBook, as we’ve just seen. Best of all, you can do both. It really is up to you and how you want to get your work out there. And yep, you guessed it. There’s a publishing package for you too. Find out a little more about our combined publishing package, if it tickles your fancy. All I would advise is that you don’t make the decision based on a ‘gut feel’ or guesswork. Doing research to influence your decision is key. If your main aim is to make money, you need to consider a blended approach. Ignoring printed books could alienate a huge portion of your target market, and whilst you aren’t guaranteed a huge revenue stream from eBooks they are likely to bring in some cash with little outlay. If you feel like you have something important to say and you want it to be heard and read, you might be tempted to go down the eBook route. It might seem like there is a larger potential audience online. This theory is flawed on two bases. Firstly, more people read printed books than eBooks, and secondly just because an eBook is bought it far from guarantees that it will be read. Of course people buy printed books and don’t read them, but that is far more common with eBooks. If this is your aim, it’s a no-brainer. You need a printed presence, especially if you are writing a series of books. But eBooks are needed too. You’re asking people who don’t know you and aren’t aware of your work or writing style to take a leap of faith by buying one of your books, they’re more likely to take a risk on an eBook than a printed book. If your strategy is to self-publish in the hope that it will be read by a traditional publishers and be picked up by them, then you are better off going for the printed approach. That being said, there would be no harm in having an eBook presence too to help with accessibility. If you are writing about something you deem deep and important, you need to print. Recall levels are much higher with printed books. If you want your story or message to be remembered, go with print. A lot of people create books for this very purpose. Having them available to sell at a conference or event is a great way of creating an extra income. You just can’t rely on people remembering to download your eBook when they get home.